Aims: A comparative study of Cilostazole and Pentoxifylline on intermittent claudication in patients of peripheral arterial disease. Materials and Methods: A total of 70 patients clinically proven occlusive peripheral arterial disease admitted at wards of General Surgery at Acharya Vinoba Bhave Rural Hospital, Sawangi, Wardha. It was prospective study the patients were randomized in two groups in 1:1 ratio. The randomization was done using a random allocation sequence generated by computer program and sequential patient consenting to participate in the study was allocated in the respective treatment arms - Cilostazole and Pentoxyphylline per the allocation sequence. Group I Patients (n=35) were administered Tab. Pentoxifylline 400 mg thrice a day; Group II (n=35), Tab Cilostazol 100 mg twice a day. History, clinical examination, all routine investigation including lipid profile, color Doppler study of lower limb and Angiography of lower limb vessels was performed at the start of the trial. Patients were re-evaluated at the time of enrolment and at 24 weeks for Intermittent Claudication Distance (ICD), Absolute Claudication Distance (ACD), and Ankle Brachial Index (ABI). Results: The group II (Cilostazole Group) showed more rise in intermittent claudication distance and Acute Claudication Distance as compared to Pentoxifylline. There was also statically improvement in ankle brachial index of Group II (Cilostazole Group) as compared to Group I (Pentoxifylline). Conclusion: Thus, the comparative analysis revealed that the efficacy of Cilostazole is more than the Pentoxifylline in increasing the ICD and ACD in patients of occlusive peripheral arterial disease with stable intermittent claudication in patients of peripheral arterial disease. Peripheral arterial disease (PAD) in the legs, sometimes known as peripheral vascular disease is caused by atheroma (fatty deposits) in the walls of the arteries leading to insufficient blood flow to the muscles and other tissues. PAD is common manifestation of systemic atherosclerosis. The most frequent symptom is intermittent claudication which results from poor oxygenation of muscles of the lower extremities and is experienced typically as an aching pain, cramping or numbness in the calf buttocks, hip, thigh, or arch of foot. Symptoms are induced by walking or exercise and relieved by rest. Besides taking history, clinical examination, and routine investigation, other specialized tests such as color Doppler study, contrast angiography, and magnetic resonance angiography is advised in doubtful cases. Ankle-brachial index (ABI) is highly useful in identifying patients with previously unrecognized PAD. It is the ratio of ankle systolic blood pressure (SBP) to brachial SBP. ABI of <0.9 is abnormal. Peripheral arterial occlusive disease is a progressive disease with significance morbidity and mortality. PAD affects 20% of adults aged 55 years with an estimated 27 million affected in North America and Europe. Claudication is the most common presenting symptoms. Overall claudication symptoms deteriorates in 25% of all those affected, with rates of 7%–9% in the 1st year and then subsequently at rate of 2%–3% years these results in an eventual critical limb ischemia incidence of 0.25–0.45/1000 people/years. Among the pharmacological management, many agents tried include rheological agents, vasodilators, antiplatelets, anticoagulants and prostaglandins, United States Food and Drug Administration has approved only two drugs, i.e., pentoxifylline and cilostazol for the treatment of intermittent claudication. Pentoxifylline is a xanthenes derivative and a nonspecific phosphodiesterase (PDE) inhibitor with action mediated through its hemorrheological properties such as decreasing blood viscosity and improves erythrocyte flexibility. It increases acute claudication distance by approximately 38%. Cilostazol is a PDE-3 inhibitor. Cilostazol is a 2-oxo-quinolone derivative that is a reversible, selective inhibitor of PDE-3A, with antiplatelet, antithrombotic, vasodilator, antimitogenic, and cardiogenic properties. Cilostazol was first identified as a potent antiplatelet agent with vasodilatory effects in Japan in the 1980s and is licensed as a therapeutic agent to improve walking distances in patients with PAD. It was a prospective study conducted at Acharya Vinoba Bhave Rural Hospital Sawangi (Meghe), Wardha of Datta Meghe Institute of Medical Sciences (DMIMS) over a period of 26 months from June 2013 to August 2015 after the approval from Institutional Ethics Committee DMIMS (Deemed University). The study was conducted on patients admitted to the surgical wards. A total of seventy patients diagnosed with PAD of lower extremity were enrolled in the study. Of these 35 were treated with cilostazol and 35 were treated with pentoxifylline. All patients with PAD who were fit for medical treatment and given consent for the research study were enrolled. Patients suffering from diabetes mellitus, a current or previous history of acute or critical limb ischemia, an endovascular or surgical procedure <6 months preceding, evidence of a comorbidity that would limit walking before the onset of claudication pain as documented during previous treadmill assessments, such as severe angina, respiratory disease, or joint dysfunction secondary to inflammatory or degenerative arthritis, were excluded from our study. After enrollment in the study, the patients were randomized in two groups in 1:1 ratio. The randomization was done using a random allocation sequence generated by computer program and sequential patient consenting to participate in the study was allocated in the respective treatment arms - cilostazol or pentoxifylline per the allocation sequence. The assessment of each patient was done at 0 and 24 weeks. The initial history and clinical examination were conducted at initial evaluation using pro forma. The following parameters were studied at initial and at subsequent follow-ups history, clinical examination, color Doppler, ABI, CBC, Lipid profile kidney function tests, and liver function tests. The detailed demographic profile was recorded and complete history including history of present illness, treatment history, onset of foot lesions and its progression and other relevant details were recorded on a predesigned pro forma. The investigations were performed as listed above and initial claudication distance (ICD) and total walking distance (TWD) were recorded by allowing them to walk on treadmill. Pain-free walking distances (PFWD) or the ICD, which is the distance walked on a treadmill before the onset of pain. TWD or the absolute claudication distance (ACD), which is the maximum or absolute distance walked on a treadmill. Then, patients were subjected to vascular color Doppler study to calculate ABI. ABI: It is the ratio of the blood pressure in the lower leg to the blood pressure in the arm. The ABI is calculated by dividing the SBP at the ankle by the SBPs in the arm. The value of 0.9–1.2 was considered normal. It was carried out by “ALOKA PROSOUND MODEL NO 20259721” with a Linear Probe of 7.5 MHz. Patients were followed up for 24 weeks after their enrollment in the study. At follow-up visit at 24 weeks, the ICD and TWD were recorded again in both groups. ABI was calculated on the same machine, “Aloka ProSound Model No 20259721” with a Linear Probe of 7.5 MHz. Out of seventy patients, 30 male patients were in cilostazol group and 30 were in pentoxifylline group whereas 4 females were in cilostazol group and 3 in pentoxifylline group; hence, there were a total of 63 males and 7 females in our study. The male is to female ratio was 9:1. Maximum patients were in the age group of 41–50 years in both cilostazol and pentoxifylline group. Minimum patients were in the age group between 71 and 80 years both in cilostazol and pentoxifylline group also. The mean ± standard deviation age of our were 55.21 ± 11.24. Out of 70 patients of affected lower limbs, 13 patients were of the right lower limb were in cilostazol group and 7 were in pentoxifylline group. Sixteen patients of the left lower limb were in cilostazol group and 11 were in pentoxifylline group. In 23 patients, bilateral lower limbs were affected. 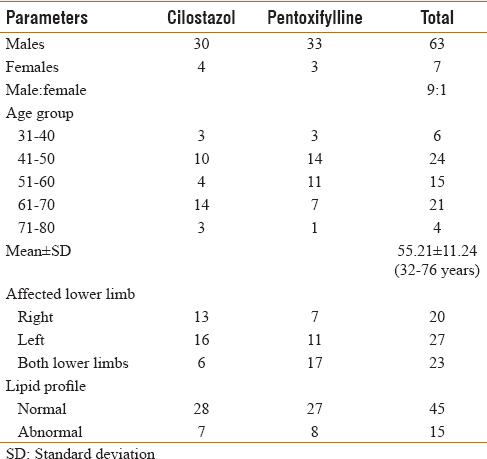 The difference of cilostazol and pentoxifylline group in affected lower limbs was not significant (P = 0.58). Twenty-eight patients of cilostazol group had normal lipid profile and 7 had abnormal. Seven patients of pentoxifylline group had normal lipid profile and 8 had abnormal. The difference in two groups is not significant (P = 0.77). Out of 70 patients of lower limb involved in color Doppler 9 patients had type A aortoiliac lesions out of which 5 were in cilostazol group and 4 were in pentoxifylline group. Five patients with type B lesions on color Doppler 4 were in cilostazol group and only 1 in pentoxifylline group. Ten patients had type C lesions in which 6 were in cilostazol group and 4 were in pentoxifylline group. In 7 patients of type D lesions, 4 were in cilostazol group and 3 were in pentoxifylline group. Out of 70 patients of lower limb involved in color Doppler, 5 patients had type A femoropopliteal lesions out of which 1 were in cilostazol group and 4 were in pentoxifylline group. Six patients with type B lesions 2 were in cilostazol group and 4 in pentoxifylline group. Ten patients had type C lesions in which 4 were in cilostazol group and 6 were in pentoxifylline group. In 7 patients of type D lesions, 3 were in cilostazol group and 4 were in pentoxifylline group. In 11 patients on color Doppler, infrapopliteal lesions were seen out which 6 patients were in cilostazol group and 5 were in pentoxifylline group. In 35 patients of cilostazol group, mean intermittent claudication at the time of enrollment was 3.09 m and after 24-week follow-up was 3.30 m. Mean TWD at the time of enrollment was 3.21 m, and after 24-week follow-up, it was 3.41 m. The difference of the intermittent claudication distance at enrollment and at 24 weeks was statistically significant P= 0.000. The difference of the TWD at enrollment and at 24 weeks was statistically significant P= 0.000 in cilostazol group. In 35 patients of pentoxifylline group, mean intermittent claudication at the time of enrollment was 2.53 m and after 24-week follow-up was 2.74 m. Mean TWD at the time of enrollment was 2.63 m, and after 24-week follow-up, it was 2.85 m. The difference of the intermittent claudication distance at enrollment and at 24 weeks was statistically significant P= 0.000. The difference of the TWD at enrollment and at 24 weeks was statistically significant P= 0.000 in pentoxifylline group. At the time of enrolment, mean intermittent claudication of cilostazol group was 3.09 m and pentoxifylline group was 2.53 m and after 24-week follow-up was 3.30 and 2.74 m respectively. At the time of enrolment, mean TWD of cilostazol group was 3.21 m and pentoxifylline group was 2.63 m and after 24-week follow-up was 3.41 and 2.85 m, respectively. The intermittent claudication distance and TWD between cilostazol group and pentoxifylline group at enrollment were statistically not significant P value 0.18 and 0.17, respectively. The intermittent claudication distance and TWD between cilostazol group and pentoxifylline group at 24-week follow-up were statistically not significant P value 0.19 and 0.18, respectively. 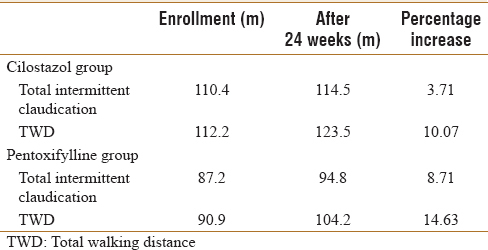 The total intermittent claudication distance of cilostazol group at the time of enrollment was 110.4 m and after 24 weeks of treatment were 114.5 m. The total intermittent claudication distance of pentoxifylline group at the time of enrollment was 87.2 m and after 24 weeks of treatment 94.8 m. Percentage increase in intermittent claudication of cilostazol group was 26.60%, and that of pentoxifylline group was 10.41%. TWD of cilostazol group at the time of enrollment was 112.2 m and after 24 weeks of treatment was 123.5 m. TWD of pentoxifylline group was 90.9 m and after 24 weeks of treatment was 104.2 m. Cilostazol increased TWD by 23.43%, and pentoxifylline increased TWD by 18.52%. At the time of enrolment, mean ABI of cilostazol group was 0.62 and pentoxifylline group was 0.61 and after 24-week follow-up ABI of cilostazol group was 0.67 and pentoxifylline was 0.69. The ABI between cilostazol group and pentoxifylline group at enrollment was statistically significant P= 0.000. The ABI between cilostazol group and pentoxifylline group at 24-week follow-up was statistically significant P= 0.000 [Table 1], [Table 2], [Table 3], [Table 4], [Table 5], [Table 6], [Table 7]. The total incidence of our study was 6% which is related to Norgren et al. (2007) total disease prevalence based on objective testing has been evaluated in several epidemiologic studies and were in the range of 3%–10%, increasing to 15%–20% in persons over 70 years., PAD is a highly prevalent manifestation of atherosclerosis that is associated with a substantial risk of illness and death and a marked reduction in ambulatory capacity and quality of life. Unfortunately, PAD is under-treated with regard to risk factor modification, use of antiplatelet drugs, and treatment of symptoms. The goals of treatment for patients with claudication are to relieve their symptoms, improve their walking capacity and quality of life. Percutaneous angioplasty and surgery can restore blood flow and relieve the symptom of PAD, but for most patients, the treatment is medicinal and should include aggressive risk factor modifications. US-FDA has approved two drugs pentoxifylline and cilostazol for treating claudication in patients with PAD. Pentoxifylline is a xanthine derivative which is also a nonspecific PDE inhibitor which improves hemorrheological properties of blood. Pentoxifylline and its metabolites improve blood flow by decreasing blood viscosity, improving erythrocyte flexibility and blood filterability and by reducing serum fibrinogen levels. Pentoxifylline also works by inhibiting platelet aggregation through inhibition of membrane bound PDE, inhibition of thromboxane synthesis and an increase in prostacyclin synthesis. It increases blood flow to the affected microcirculation, thus, improving tissue oxygenation and perfusion. The present study shows that cilostazol significantly increase ICD by 26.60% and ACD by 23.43% at the time of enrollment and at 224 weeks which is related to study by Singh et al. 2009 (cilostazol significantly increase ICD by 53.18% and ACD by 42.41% from baseline at 12 weeks). This significant rise in ICD and ACD with cilostazol is also reported by Dawson et al. 1998, Money et al. 1998, Regensteiner et al. 2002, and Thompson et al. 2002. The ABI is a reliable, noninvasive screening tool for lower extremity ischemia and function with a sensitivity of 95% and specificity of 99% for angiographically diagnosed PAD. The ABI is useful in identifying high-risk patients who might otherwise go unrecognized. The ABI is defined as the ratio of the average SBP in the ankle (dorsalis pedis and posterior tibial arteries) divided by the average SBP in the arm (brachial arteries). The normal range for the ABI is 1.0–1.3. In PAD, SBP below the narrowing arterials is reduced, resulting in a fall of ankle SBP below the brachial SBP and the ABI is reduced to <1.0. An ABI of 0.9 or less is considered diagnostic of PAD. In our study, out of 35 patients in cilostazol group mean ABI at the time of enrollment was 0.62 ± 0.09 and after 24 weeks mean ABI was 0.67 ± 0.10 with P= 0.000 which was significant. Similarly, out of 35 patients in pentoxifylline group at the time of enrollment mean ABI was 0.61 ± 0.12 and after 24 weeks, was 0.69 ± 0.01 with P= 0.95 which was not significant. In a study by Resnick et al. (2004), in 865 women aged 65 and older, discovered that patients with ABI <0.6 were at higher risk of having impaired walking abilities. In an earlier study Resnick et al. reported that among patients with PAD, decreased in ABI values were associated with decreases in 6 min walk distance, maximum walking speed, and walking endurance. Each increase of 0.4 in the ABI was associated with an increase in the 6 min walk distance and usual and maximal walking speed. In the strong heart study (2004), an ABI of >1.40 was associated with increased all-cause and cardiovascular mortality. In cases of no compressibility at the ankle level, the toe brachial index (the ratio of the systolic pressure of the toe to that of the arm) may be used. In our study, out of 70 patients of lower limb involved in color Doppler 9 patients had type A aortoiliac lesions out of which 5 were in cilostazol group and 4 were in pentoxifylline group. Five patients with type B lesions on color Doppler 4 were in cilostazol group and only 1 in pentoxifylline group. Ten patients had type C lesions in which 6 were in cilostazol group and 4 were in pentoxifylline group. In 7 patients of type D lesions, 4 were in cilostazol group and 3 were in pentoxifylline group. Out of 70 patients of lower limb involved in color Doppler, 5 patients had type A femoropopliteal lesions out of which 1 were in cilostazol group and 4 were in pentoxifylline group. Six patients with type B lesions 2 were in cilostazol group and 4 in pentoxifylline group. Ten patients had type C lesions in which 4 were in cilostazol group and 6 were in pentoxifylline group. In 7 patients of type D lesions, 3 were in cilostazol group and 4 were in pentoxifylline group. In 11 patients on color Doppler, infrapopliteal lesions were seen out which 6 patients were in cilostazol group and 5 were in pentoxifylline group. In a study by Kohler et al. they performed 155 duplex examinations for symptomatic aortoiliac and femoropopliteal artery disease. Data from 32 patients who underwent angiography within 3 months of this noninvasive examination form the basis of this report. Each arterial segment is graded into five categories of stenosis: normal, 1%–19% diameter reduction, 20%–49% diameter reduction, 50%–99% diameter reduction, and total occlusion. Complete examinations were performed in twenty patients. Examinations (generally, both angiograms and duplex scans) were directed to only one extremity in four cases, to only femoropopliteal segments in three cases, and to only aortoiliac segments in five cases. One segment (an iliac artery) could not be investigated by duplex scanning because of overlying bowel gas. Common femoral arteries could not be studied by angiography because of overlying metal orthopedic prostheses in one patient. A total of 393 arterial segments were studied by both methods. In the two-way contingency table for classification of disease by duplex scanning and angiography, the kappa value was 0.55. Exact agreement occurred in 273 (69%), and agreement within one category occurred in 343 (87%). For correctly identifying lesions that had a significant measured pressure gradient or were >50% diameter reducing, duplex scanning had a sensitivity of 82%, a specificity of 92%, a positive predictive value of 80%, and a negative predictive value of 93%. Five of the significant stenoses missed by duplex scanning were less than total occlusions, where flow rates were inadequate to produce significant velocity increased. Duplex scanning combining a B-mode ultrasound image with a pulsed Doppler flow detector and spectrum analyzer. This allows acquisition of Doppler information directly from areas of stenosis and measurement of the Doppler angle. Flow velocity was increased at sites of stenosis, and turbulence develops. Duplex scanning can detect both of these hemodynamic changes. In a study by Das et al. a total of 60 patients including both sexes (35 males and 25 females) were evaluated using duplex sonography. A maximum number of patients were in the age group of 40–49 years (26 patients) followed by 50–59 years (23 patients) and 60–75 years (11 patients), respectively. The oldest patient was a 73-year-old female. Females were less as compared to males in all age groups. Most number of females belonged to 40–49 years age groups (12/25; 48%) whereas maximum numbers of males were from 50 to 59 years age group (15/35; 42.8%). Highest numbers of plaque-positive patients were from the 50–59 years age group with all of 23 patients having plaques followed by 40–49 years age group (19/26). Overall 44% of patients had atherosclerotic plaques. Femoral artery was the most common site of plaque deposition, with left femoral artery being more commonly affected than right femoral artery; however, overall more plaques were seen on the right side as compared to left side. No plaque was seen in popliteal arteries. Out of a total of 50 plaques, 28 showed evidence of calcification within them; thirteen showed fibro-fatty echo texture and only two plaques were purely fatty in appearance. Luminal narrowing with irregular concentric wall calcifications was most commonly found in dorsalis pedis arteries, more so in left-sided arteries (in 36% on right side and in 41% on left side). In femoral artery, the most common range of velocity in all age group was 55–69 cm/s (52.4%). Next common range of velocity was 70–84 cm/s (28.6%). Low resistance pattern suggestive of distal ischemia was observed more commonly in dorsalis pedis artery (25.5%) followed by anterior tibial (23%) and posterior tibial (21.5%) artery. All the patients had some degree of atherosclerotic disease in lower limb arteries with the highest number of plaque-positive patients occurring in the age group of 50–59 years. The involvement of lower limb arteries was usually asymmetrical to the presence of diabetes mellitus in the body. The most common artery with luminal narrowing in their study was dorsalis pedis followed by anterior and posterior tibial arteries. It is concluded from the present study that cilostazol is more effective from PFWD or the ICD, which is the distance walked before the onset of pain. Cilostazol is also more effective for improving TWD or the ACD. Hence, cilostazol is a better drug than pentoxifylline for improving ABI and claudication distance in patients of PAD with stable intermittent claudication. Hankey GJ, Norman PE, Eikelboom JW. Medical treatment of peripheral arterial disease 2006;295:547-53. Hiatt WR, Hoag S, Hamman RF. Effect of diagnostic criteria on the prevalence of peripheral arterial disease. The San Luis Valley Diabetes Study. Circulation 1995;91:1472-9. Schmieder FA, Comerota AJ. Intermittent claudication: Magnitude of the problem, patient evaluation, and therapeutic strategies. Am J Cardiol 2001;87:3D-13D. Norgren L, Hiatt WR, Dormandy JA, Nehler MR, Harris KA, Fowkes FG. Inter-Society Consensus for the Management of Peripheral Arterial Disease (TASC II). Journal of Vascular Surgery 2007;45:S5-67. Criqui MH, Fronek A, Barrett-Connor E, Klauber MR, Gabriel S, Goodman D. The prevalence of peripheral arterial disease in a defined population. Circulation 1985;71:510-5. Selvin E, Erlinger TP. Prevalence of and risk factors for peripheral arterial disease in the United States: Results from the National Health and Nutrition Examination Survey, 1999-2000. Circulation 2004;110:738-43. Lee TM, Su SF, Hwang JJ, Tseng CD, Chen MF, Lee YT, et al. Differential lipogenic effects of cilostazol and pentoxifylline in patients with intermittent claudication: Potential role for interleukin-6. Atherosclerosis 2001;158:471-6. Ward A, Clissold SP. Pentoxifylline. A review of its pharmacodynamic and pharmacokinetic properties, and its therapeutic efficacy. Drugs 1987;34:50-97. Dawson DL, Cutler BS, Meissner MH, Strandness DE Jr. Cilostazol has beneficial effects in treatment of intermittent claudication: Results from a multicenter, randomized, prospective, double-blind trial. Circulation 1998;98:678-86. Regensteiner JG, Ware JE Jr., McCarthy WJ, Zhang P, Forbes WP, Heckman J, et al. Effect of cilostazol on treadmill walking, community-based walking ability, and health-related quality of life in patients with intermittent claudication due to peripheral arterial disease: Meta-analysis of six randomized controlled trials. J Am Geriatr Soc 2002;50:1939-46. Thompson PD, Zimet R, Forbes WP, Zhang P. Meta-analysis of results from eight randomized, placebo-controlled trials on the effect of cilostazol on patients with intermittent claudication. Am J Cardiol 2002;90:1314-9. Hirsch AT, Criqui MH, Treat-Jacobson D, Regensteiner JG, Creager MA, Olin JW, et al. Peripheral arterial disease detection, awareness, and treatment in primary care. JAMA 2001;286:1317-24. Resnick HE, Lindsay RS, McDermott MM, Devereux RB, Jones KL, Fabsitz RR, et al. Relationship of high and low ankle brachial index to all-cause and cardiovascular disease mortality: The Strong Heart Study. Circulation 2004;109:733-9. Kimura Y, Tani T, Kanbe T, Watanabe K. Effect of cilostazol on platelet aggregation and experimental thrombosis. Arzneimittelforschung 1985;35:1144-9. Lindgärde F, Jelnes R, Björkman H, Adielsson G, Kjellström T, Palmquist I, et al. Conservative drug treatment in patients with moderately severe chronic occlusive peripheral arterial disease. Scandinavian Study Group. Circulation 1989;80:1549-56. Rössner M, Müller R. On the assessment of the efficacy of pentoxifylline (Trental) J Med 1987;18:1-15. Kohler TR, Nance DR, Cramer MM, Vandenburghe N, Strandness DE Jr. Duplex scanning for diagnosis of aortoiliac and femoropopliteal disease: A prospective study. Circulation 1987;76:1074-80. Das G. Doppler in lower limb arteries. Int J Res Health Sci 2015;3:18-23.